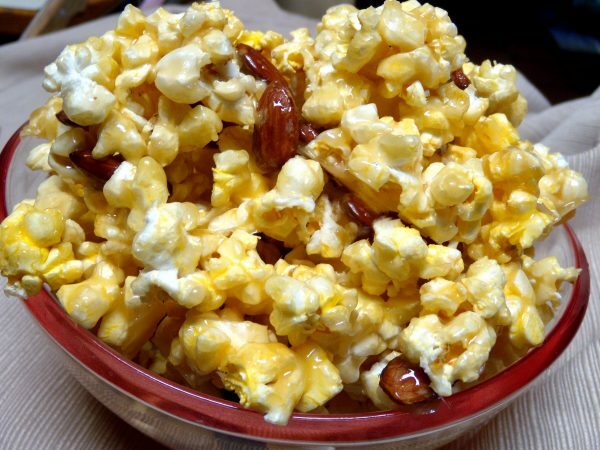 Spread popcorn and toasted nuts on a lightly greased baking sheet. Remove all un-popped kernels. In a medium saucepan, combine sugar, butter and corn syrup. Cook on medium high heat until sugar dissolves and mixture comes to a boil. Insert candy thermometer and stir occasionally, until thermometer reaches 290 degrees or soft crack stage. (Mixture will have a light caramel color.) Remove from heat and stir in vanilla. Cool mixture. Break into chunks and store in a tightly covered container.